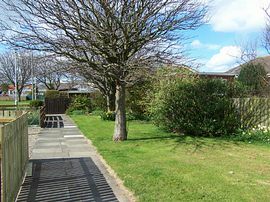 Seal Cottage is a very attractive, fully refurbished bungalow and is has been welcoming guests since 2009,many who return every year. It offers cosy, comfortable holiday accommodation for any time of the year. The house is furnished to a high standard in a modern, tasteful style with decor which reflects the coastal location. 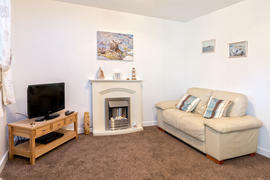 It is situated in the Coastal Village of Beadnell famed for its glorious beaches. Beadnell Bay, with its unspoilt sandy beach, is a few minutes walk along the sea front. The quiet North Beach is a very short walk, as is the village with, 2 pubs both serving meals and one with a very good restaurant. It is an excellent holiday base from which to explore Northumberland's Heritage Coastline, with all it has to offer. Accommodation is on one level. 1 small step and a hand rail at the entrance. Entrance Porch for outdoor wear with heated rail for drying coats and outdoor wear. Lounge/ Dining room. This spacious, room has comfortable leather sofas, dining table and chairs, TV + digital freeview box, DVD, Radio/CD player. Storage heater and electric fire. Fully fitted kitchen - Very well equipped with electric hob and oven, microwave, fridge/ freezer, washer ( there is a drier in the shed), toaster etc. Double Bedroom - Double bed, fitted furniture, bedside lighting, electric panel heater. All bed linen, duvets and soft fluffy towels included in the rent. Shower room - Fully tiled with shower cubicle (safety hand rail), good quality electric shower, whb and WC, radiator/ towel rail and electric shaver point and light. 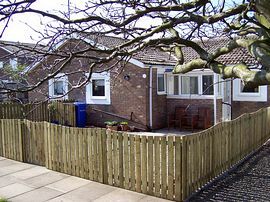 Enclosed garden with patio and garden furniture and line drying. Fully adjustable electric heating throughout and electric fire. Courtesy tray for guests on arrival. Guide books, games, jigsaws provided. Linen, towels and electricity included in rental. House trained dogs by arrangement. Bus service, 2 pubs serving good meals in village, post Newsagent/ general store. Fish shop. Boat launching. £315.00 - £485.00 per week. Short Breaks: Minimum 3 night breaks available November to Easter. Available for letting all year.